Steve Wood portrays the sixteenth president of the United States, Abraham Lincoln. Friday, Sept. 4 at 1:30 p.m. — RUTLAND — Bernard Osher, a native of Biddeford, Maine is an extremely successful business man and community leader whose continuing philanthropy has touched many lives. The Bernard Osher Foundation, established in 1977 in California funded the Osher Lifelong Learning Institute in the fall of 2002 and since then has supported 117 lifelong learning programs. The premise of the institute is to offer educational programs for seasoned adults age 50 and over. There must be a university connection and university support, volunteer leaders and a diverse repertoire of intellectually stimulating courses or lectures. Rutland is fortunate to have an Osher Lifelong Learning Institute under the auspices of the University of Vermont. There is a volunteer Board of Directors comprised of local people who work year round to provide interesting topics and draw upon local experts from the surrounding areas to share their expertise. The Board of Directors recently announced the 2015 fall program. The September series will start on Friday, Sept. 4 and will cover “The American Presidency.” Steve Wood will begin with an in depth look at our sixteenth president, Abraham Lincoln. 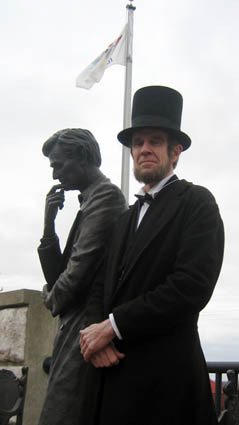 Wood has been portraying Lincoln since 1995. The series will continue with an overview of Presidents Calvin Coolidge, George Washington and Jimmy Carter. Vermont will be featured in October and a variety series in November will include topics from gravestones to Norman Rockwell. The lecture series is held on Friday afternoons at the Godnick Center in Rutland, starting at 1:30 p.m. and ending by 3 p.m. There is a $5 charge per lecture or $40 for the entire series. www.learn.uvm.edu/osher. For more information, call 802-422-2921.